Everyone knows about the Olympics. What would it be like if animals had their own Olympics? Audiences learn important values and character-building lessons as they cheer for kittens, squirrels, and orangutans competing in yarn-ball scrimmages, banana toss finals, nut-burying championships and more in this action packed production! Animals compete in hilarious sports activities and portray positive examples of self-determination, good sportsmanship, respect for others, good attitude, conflict resolution and more. 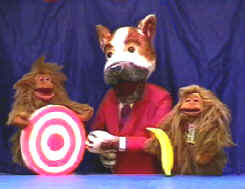 Three different styles of puppets: Hand, Hand-and-Rod (Muppet style), and Rod Puppet. An informative description is given of each style as a post-show demonstration. Not just a "sit and watch" show, young audiences participate with special "Animalympic" cheers and even do calisthenics with squirrels! Grownups will be delighted! 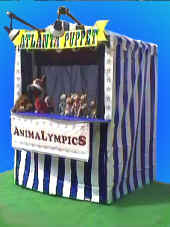 Animalympics is presented in a classic professional puppet booth. The show can be performed indoors or outside. Sound system and lighting comes with show. A small 8 ft. X 8 ft. performance area is all that is needed for what will surely be acclaimed as the highlight of your summer programming!